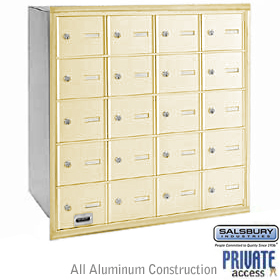 4300 series roadside mailboxes feature a front and rear access locking door. Roadside mailboxes can also be mounted in columns, masonry or walls. Each unit includes an outgoing mail tray, a lock with two (2) keys on each door (keyed alike) and an adjustable red signal flag. Mail is deposited through a non-locking access panel on the front. 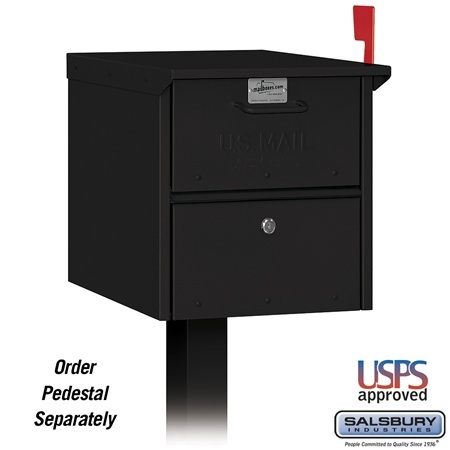 Roadside mailboxes can be mounted on the optional bolt mounted (#4365) or in-ground mounted (#4385) aluminum pedestals or in-ground mounted 1-sided deluxe posts (#4370) or a base of your choice. ORDER PEDESTALS SEPARATELY, which have the brackets welded on. We do not offer just the brackets by themselves, or included with the units. Multiple roadside mailboxes can be mounted on in-ground mounted 2-sided deluxe posts (#4372) or on standard posts using optional spreaders (related items #4382 and #4383). Roadside mailboxes can also be mounted in columns, masonry or walls. Non-locking thumb latches (related item #4388) are available as an option upon request. Roadside mailboxes are approved for U.S.P.S. curbside mail delivery.